For years now I have been making rope out of various different natural materials. 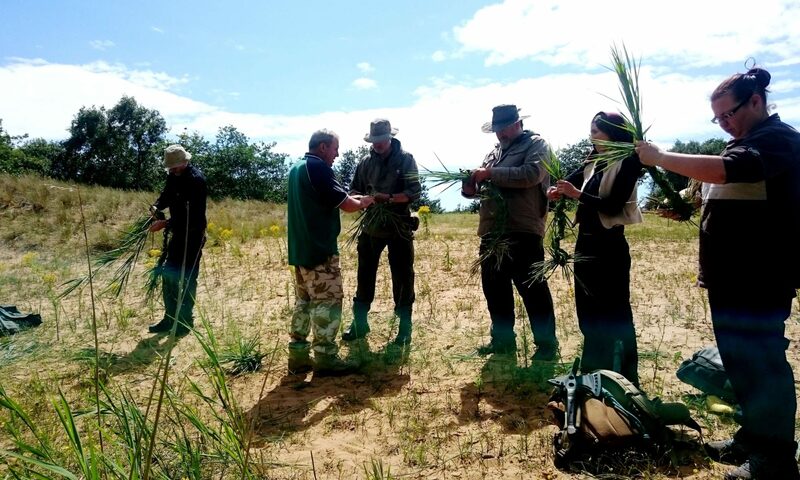 This has generally been a relaxing though time-consuming process for me, until Perry McGee from the National Tracking School taught me at the Bushcraft UK Bushmoot that it could be a fun and frantic process as well. 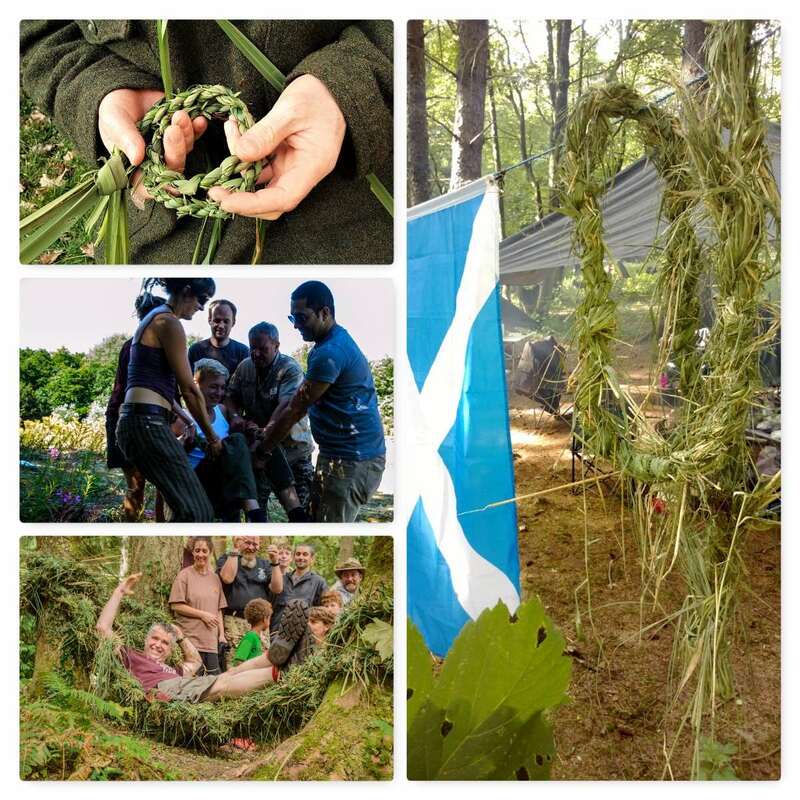 Now this may not be the prettiest, smoothest or most perfectly formed rope, but it is fast to make, strong enough for most camp jobs and can be made out of many different grasses. 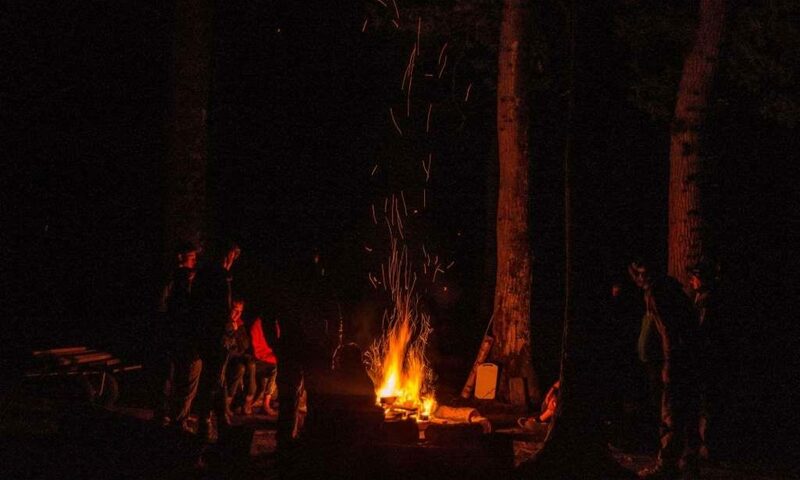 This is a technique that is not just for bushcrafters but for any outdoor pursuits leader (I am a Mountain Leader as well) as a way of putting a rope together in an emergency. 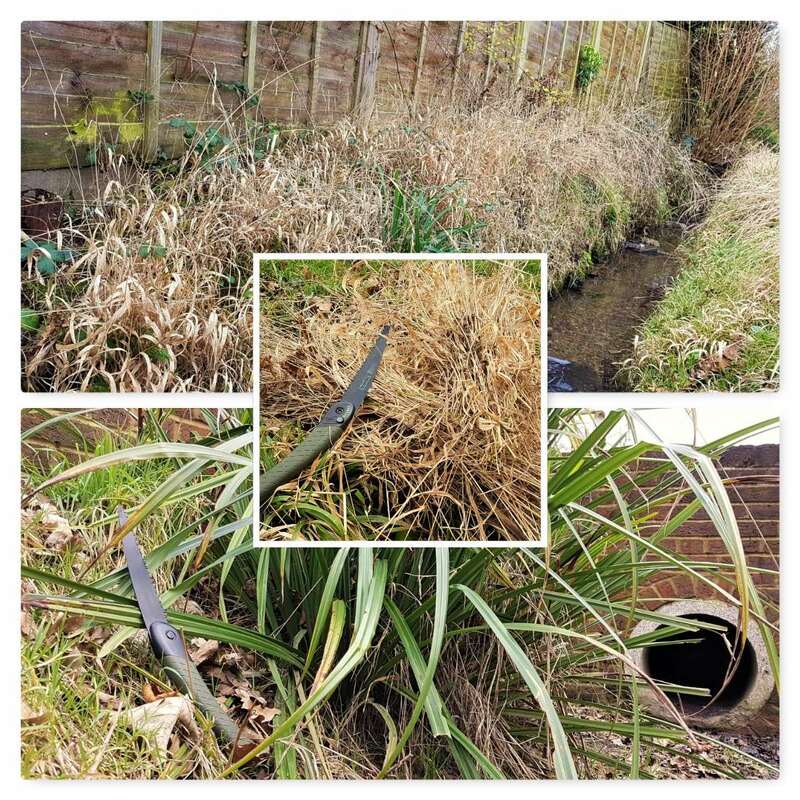 For this blog I had a wander along a nearby stream and harvested some dead grasses and some leaves from a Pendulous sedge. To harvest the grasses I would advise you to wear gloves and use something like a Laplander saw to cut the grass. Gloves are useful to protect you from hidden brambles etc and also because you can easily slice your fingers open on some grasses. 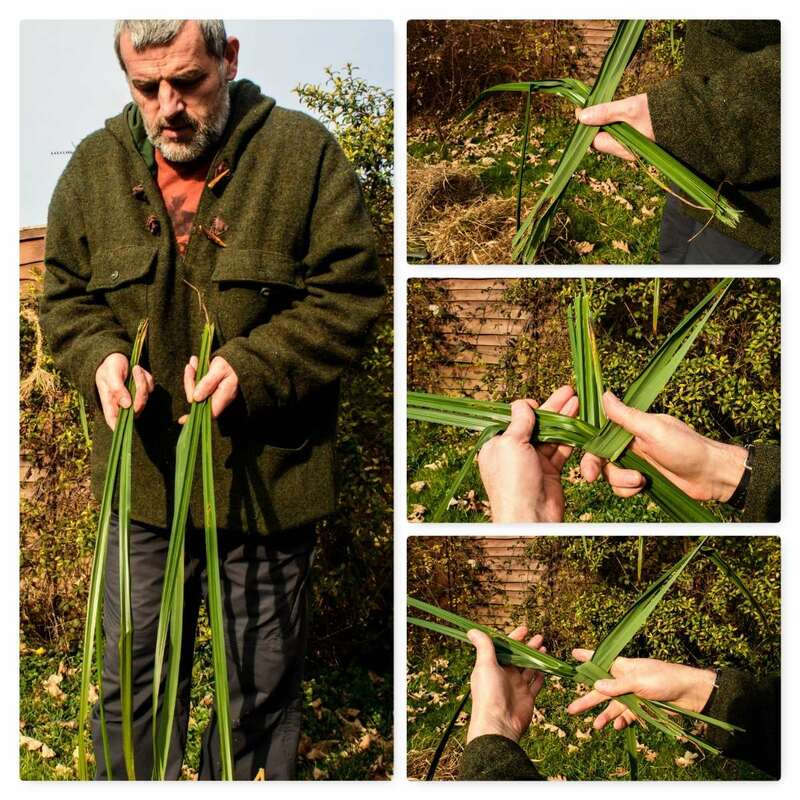 I do not use a knife as I find grass quickly blunts its edge, so instead I hold the grass firmly half way along its length and sweep the base of it with the saw before pulling the grass away. Pulling grass straight out of the ground with bare hands will eventually lead to cuts on the inside of your fingers. To start your rope off begin with two evenly thick strands (this thickness will determine the overall thickness of your rope). 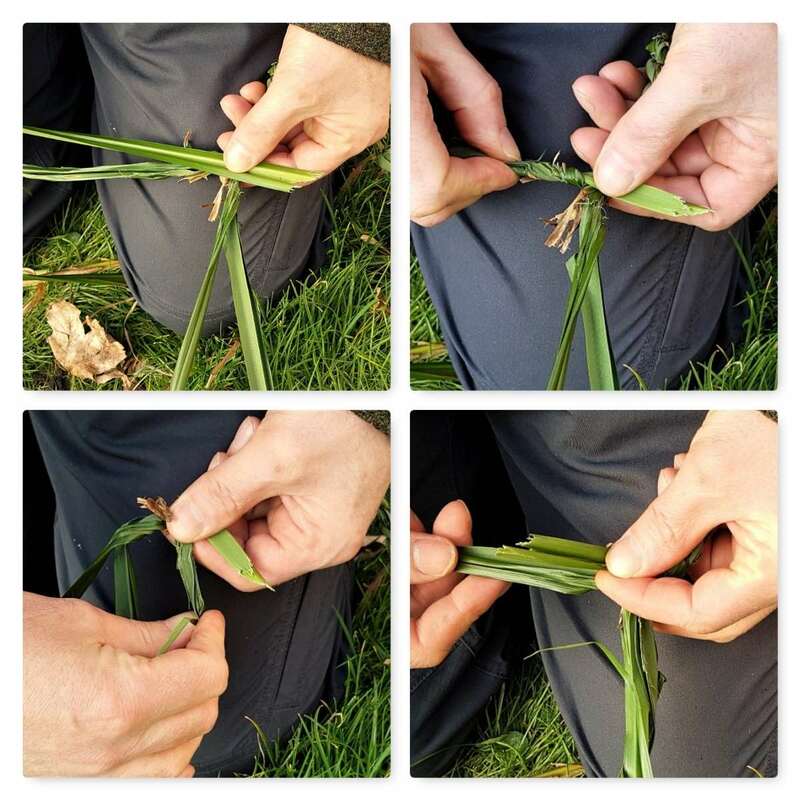 I vary the individual lengths of the grass within each strand so that as it thins out and I add in more grass later the joins will be staggered (this will make a stronger rope). 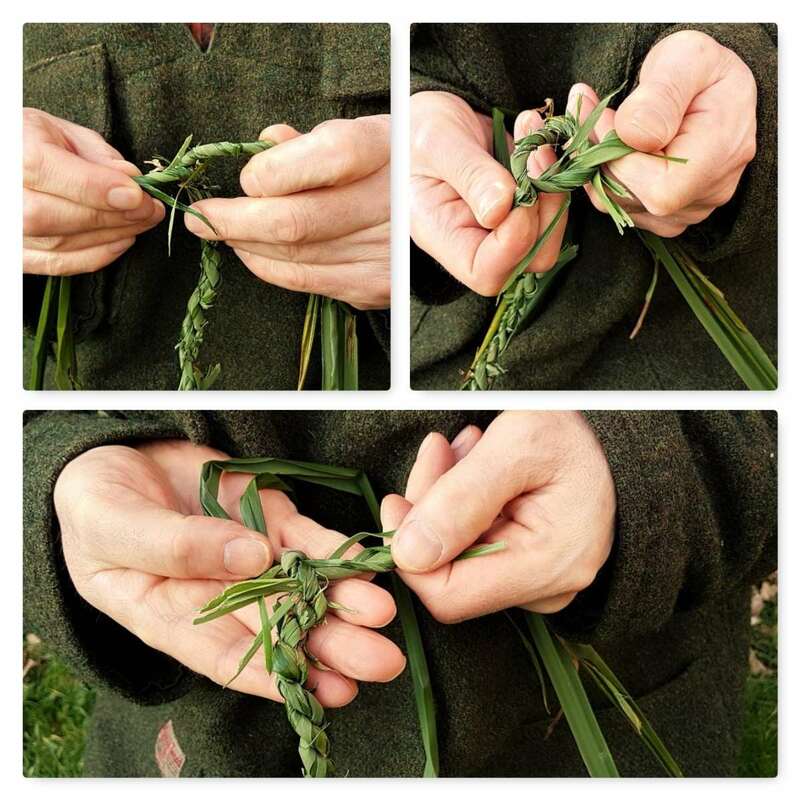 Form the X first (the ends of the grass nearest to me are called the standing ends) close to the standing end and then wrap one of the standing ends under the other strand, back through the middle, and join it to the other standing end to form the Y shape. You can see all the steps below. In the pictures below I am holding both the standing ends in my left hand (on the right in the picture) and twisting the strand closest to me a couple of times towards myself. Keeping the tension on the twist, I then turn the newly twisted strand away from me over the top of the other strand and clamp it in place with my left thumb (I have added a video at the end of the post to show you this in more detail). Once done this means the other strand will be closest to me, and it’s simply a case of repeating the process of twisting the closest strand towards me a couple of times, then turning it away from me over the top of the other strand and carrying on. 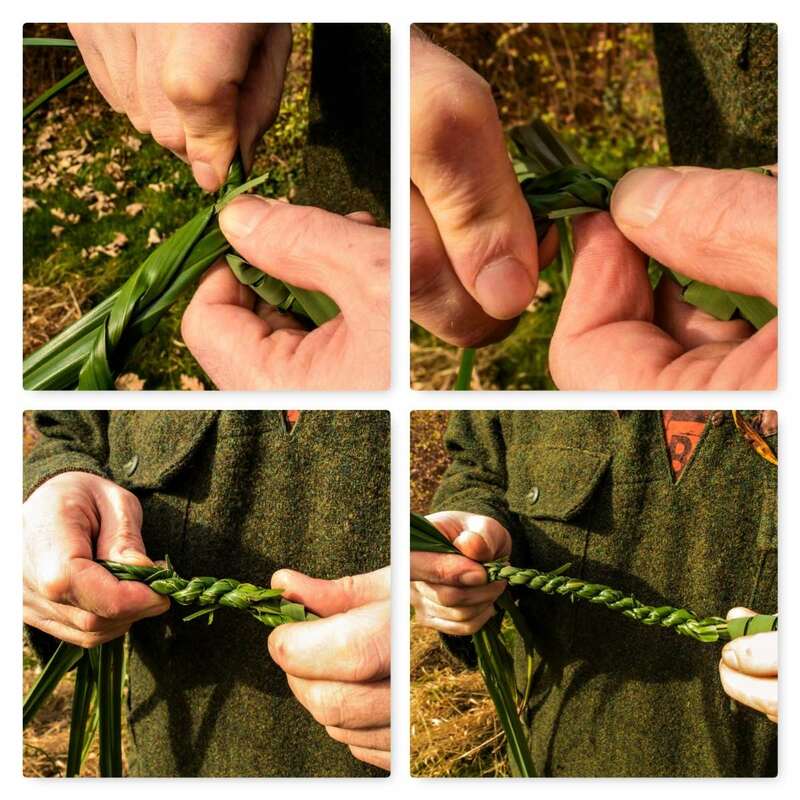 It does not take long to start forming the rope but you do have to be careful when using whole pieces of grass as you can easily cut yourself. The rope made from this fresh grass will be perfectly usable in the short term however as it dries out and shrinks the strands will loosen. If I had wanted to make rope for long-term use I would have stored the harvested grass until it had dried out and then re-wetted it before making the rope. This would mean the rope would not shrink and loosen afterwards. Eventually one of the strands will start to get thinner. It is at this point you will need to add in more grass. I lay a fresh piece of grass into the strand that is thinning out with the short end sticking out by a couple of centimetres. After twisting and laying in the strand as normal I twist the small piece sticking out back and incorporate it into the other strand. Every time a strand starts to thin out I add another piece of grass in this way. Once I have finished the rope to the length I want I finish the end of by twisting the two strands tightly and tie it off with an overhand knot. 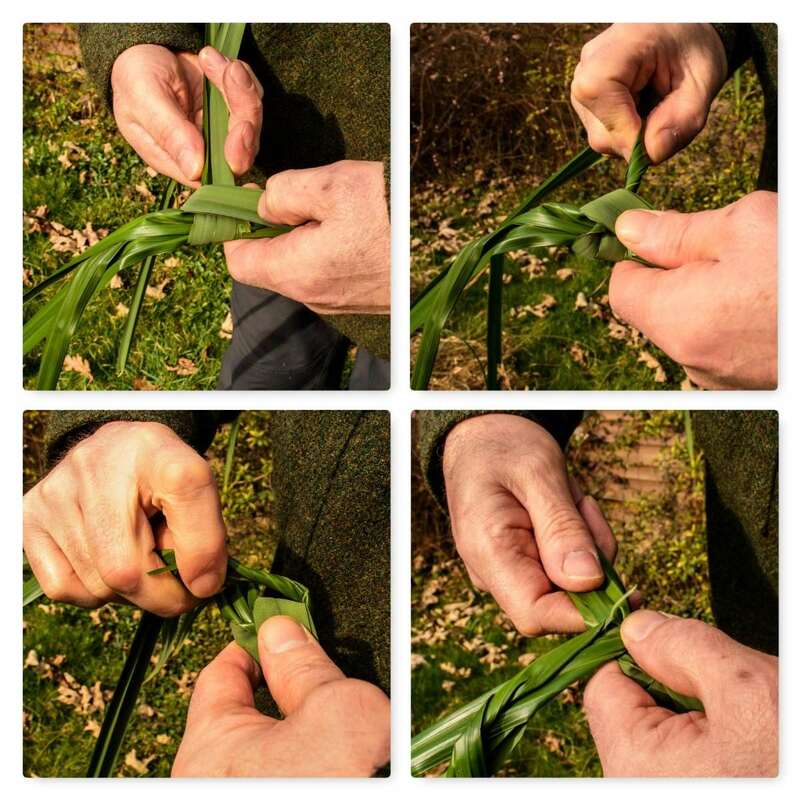 To finish you can trim off any pieces of grass that are sticking out with a knife if you want to tidy it up. Perry insists that students on his tracking courses should be able to make thick coils of rope the length of their body in about a minute. I have a bit to go to be able to do that but as you can see below the rope – whether it is thin or thick – can be used for many purposes. 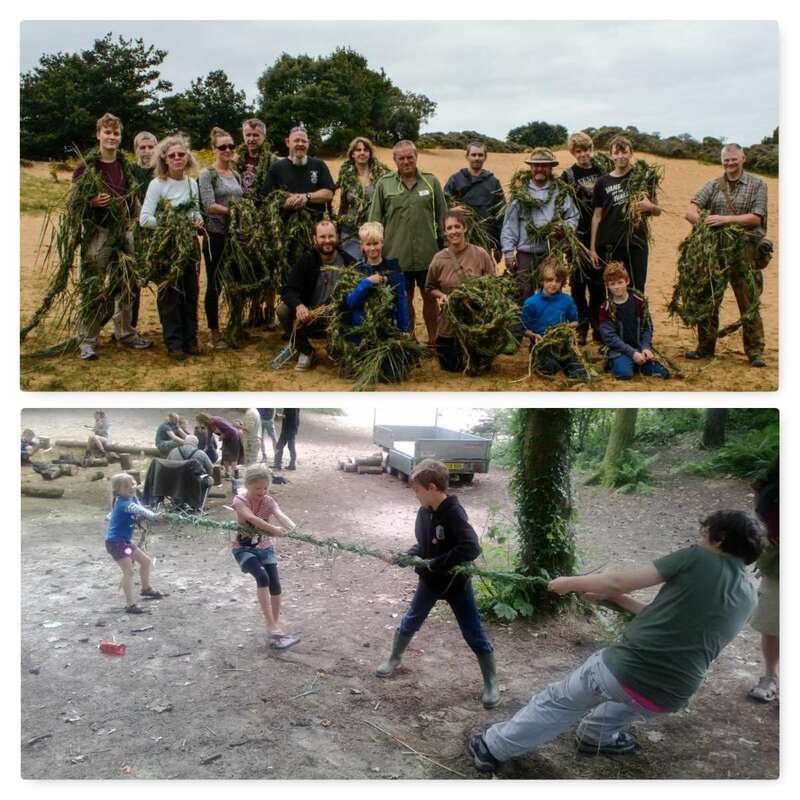 You can evacuate a casualty, construct a hammock, make coil baskets or even a great tug of war rope to keep the kids (of all ages) happy. As the steps can be a little hard to follow with just pictures I put this short video together to show you the process in action. Have fun, and I’d love to see pictures of the rope you make! Cheers for the share guys.